This entry was posted on March 26, 2019 by Rick. 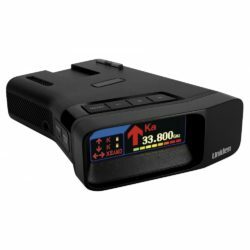 The Uniden R7 is one of the most highly anticipated new radar detector products of the year, and detector enthusiasts are eagerly awaiting its arrival. At this time the estimated ship date is late March to early April 2019, but there's no need to wait in line to get yours. That's because the Uniden R7 is now available for pre-order direct from our site at Buy Radar Detectors! If you haven't heard of the R7, check it out. It's similar in features and function to a Uniden R3, but with the addition of an OLED display with directional arrows. It is equipped with GPS, Eagle Eye for 360° laser detection, 5 Level Signal Strength Meter, MAX Speed Warning System and upgradeable firmware. It's also Spectre Elite undetectable. One reason for the attention to the R7 is its directional arrows. It's somewhat reminiscent of the Valentine One, which seems to be a popular feature among Valentine fans. According to a recent poll on a popular radar detector forum, over 35% of respondents said they would switch their V1 for a Uniden R7 after it arrives. That is a significant number, and says a lot about the anticipation level for this new detector. Whether it's about the arrows or not, there is certainly plenty of excitement in the air for the new Uniden R7, and no doubt there will be a rush to buy one as soon as it arrives to market. So why wait? Pre-order yours now to avoid the initial sellout. We will have a limited supply available on the first shipment, so secure your order today!